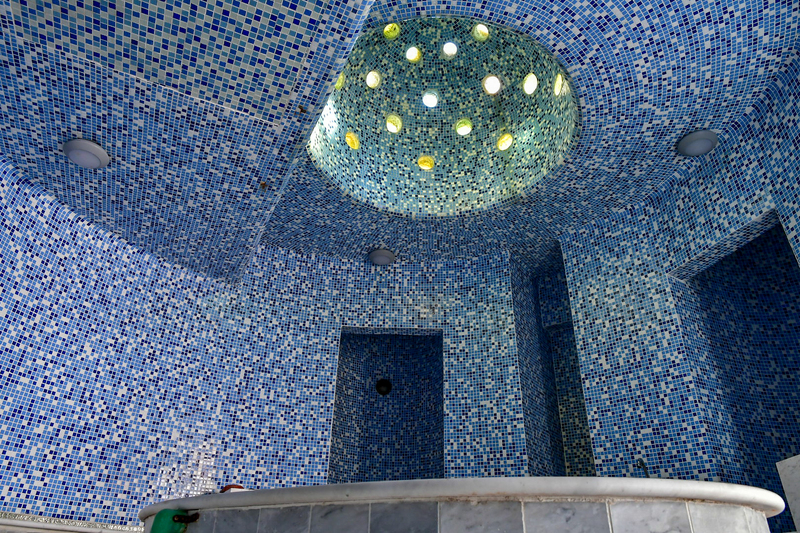 E-Hotel Spa & Resort is an exciting, stylish, Mediterranean destination hotel, skillfully designed with the finest amenities and seamlessly integrates with earth's natural elements. These natural elements, its contemporary design and unique cultural balance are blended in perfect harmony with cutting edge technological innovation. Shimmering like a mirage, direct on the sea front, E-Hotel Spa & Resort is set in lush landscaped grounds overlooking the Mediterranean Sea. Positive health and wellness attitude incorporates with world-class service philosophy - a memorable escape ensuring total restoration of the mind, body and spirit. In our Eden Spa, surrender yourself to absolute bliss in a luxurious, calming environment with pampering so rejuvenating, so relaxing that tension and stress just float away. In the Eden Spa, well being is promoted through Holistic Therapies and an Ecological approach by using natural products. 46 Standard Rooms, cosy and intimate, with soft carpet atop polished ceramic and concrete floor opening to an Juliet balcony most with a sea view; bathroom with luxurious overhead rain shower. Two rooms feature handicap accessible bathrooms with safety bars. 2 Superior Rooms, open plan with a south eastern outlook offering side views, featuring lounge area and beautiful bathroom with extra long bath and overhead rain shower. 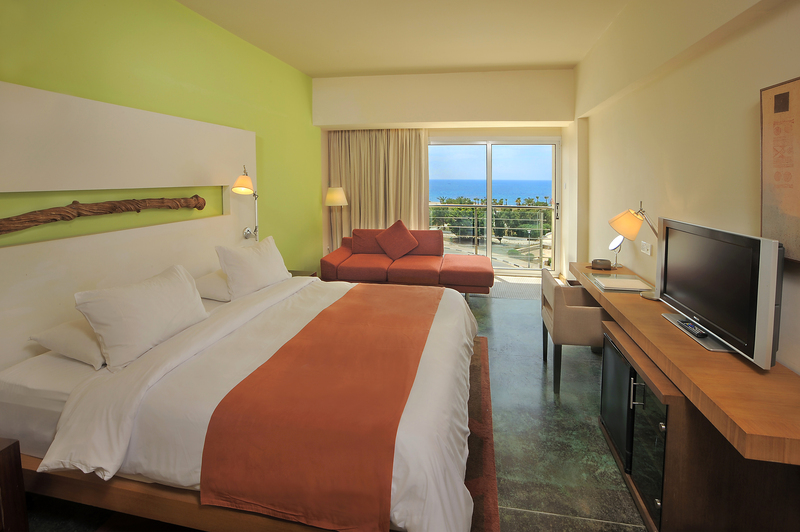 4 Deluxe Rooms, located in the superior southern corners of the hotel that open onto spectacular uninterrupted front sea views, the rooms are a heaven of peace and tranquility; bathroom with an extra long bath for a luxurious soaking and overhead rain shower. 9 Garden Studios, stylish and secluded upstairs retreat, furnished with marble and soft carpet; complete with a romantic round bath tub and private outdoor veranda. 9 Garden Villas, affording space and privacy on a grand scale with kitchen, lounge room, separate bedroom and bathroom complete with Jacuzzi Bath Tub, plus a 2nd shower and wc; double sofa bed for extra guests; floor to ceiling glass sliding doors open to an outdoor deck, featuring a private pool and terraced garden area complete with teak sun beds for lounging. The Sky Lounge, with 360-degree views of the magnificent sea and beautiful countryside, is ideal for a romantic wedding ceremony as well as wedding receptions. E-Hotel Spa & Resort offers you a variety of venues, services and settings for this special day of your life. 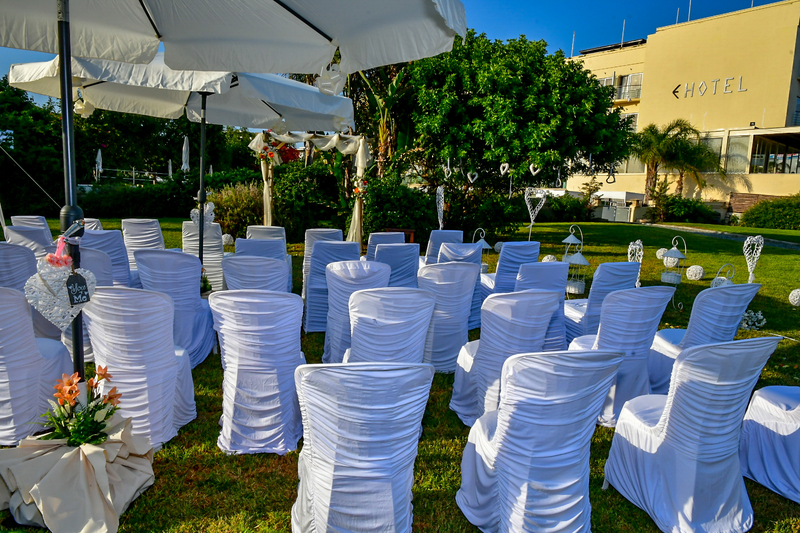 The impressive array of excellent catering facilities and the personal attention of our experienced staff will make this day unique for you! 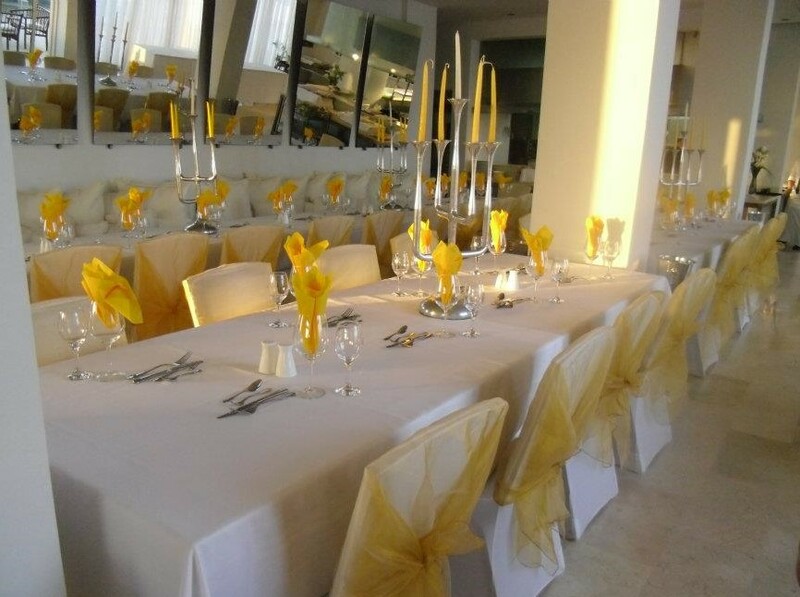 With its beautiful views of the coast and the lighthouse, Franke restaurant and its terrace can hold up to 100 guests for a banquet and wedding buffet. There’s a detached bespoke Event centre that takes from 80 to 200 guests for a wedding banquet. 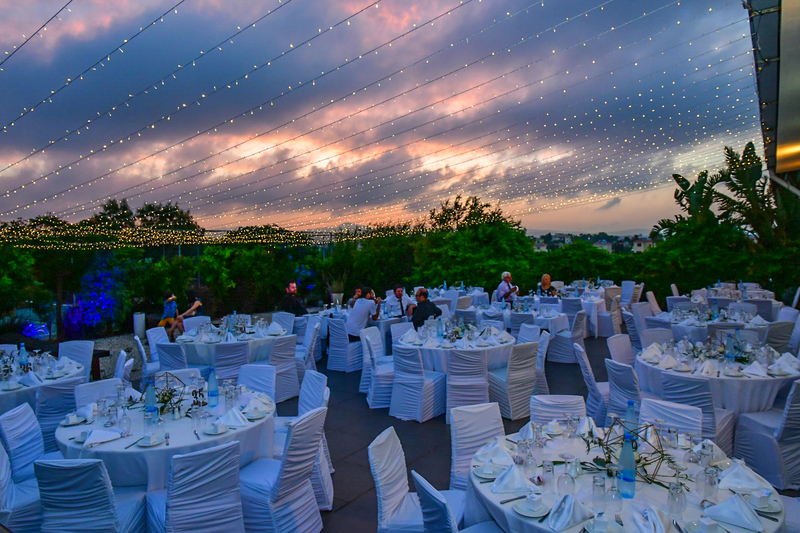 This venue has its own entrance, terrace and kitchen that can host elaborate and mouth-watering meals. 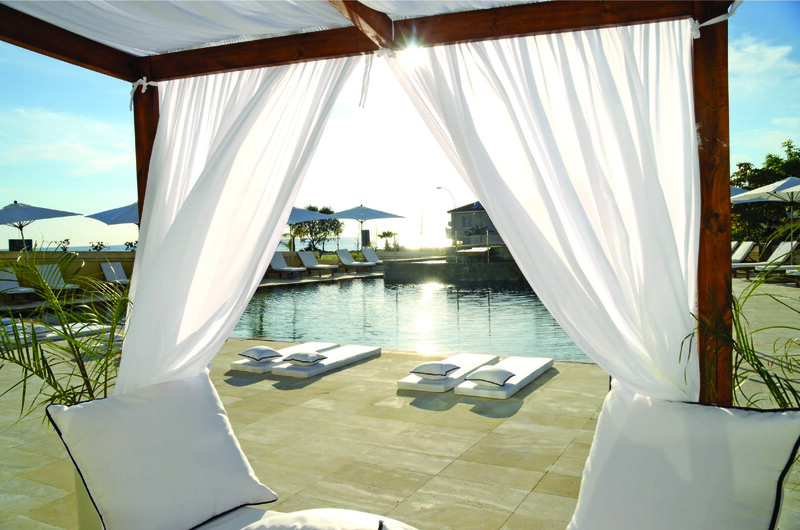 * The E-Hotel Spa & Resort accepts only one wedding booking per day. 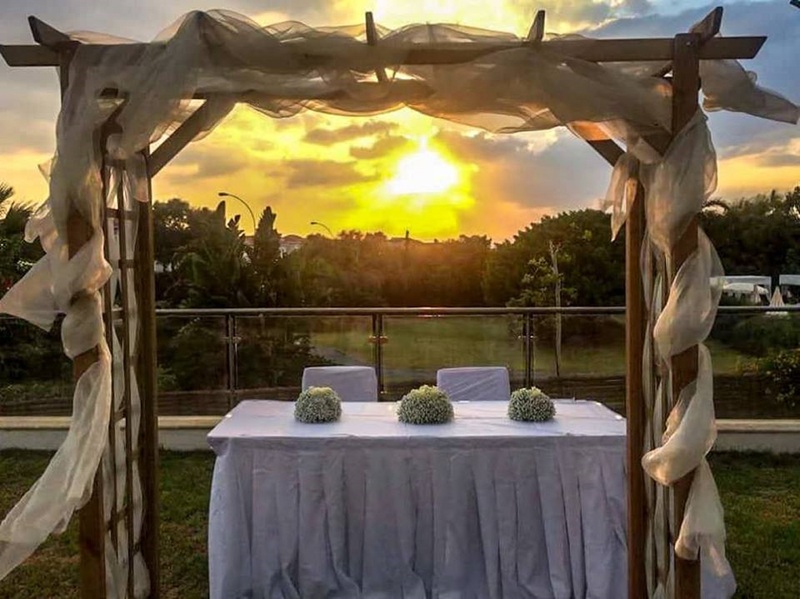 If you wish to change the time of the wedding, please contact directly our Sales Department at support@bookyourweddingday.com in order to finalise the time. * A non refundable deposit of €300 is payable to the hotel upon booking confirmation.